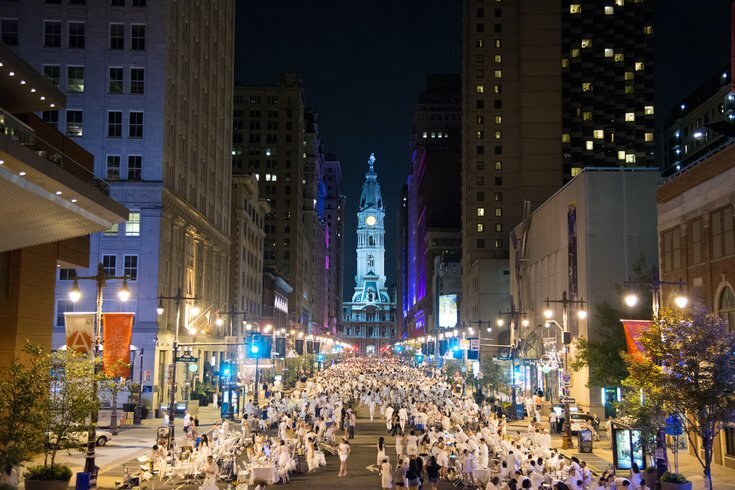 The 2014 Diner en Blanc took place on Broad Street. Whether you love it or harbor deep angst about it, Philadelphia's Dîner en Blanc has opened its 2018 waitlist. Event organizers revealed that the annual summer dinner party, which requires its thousands of attendees to don all-white attire and set up all-white chairs and tables before enjoying a BYO dinner, is scheduled for Aug. 16. The location, as is tradition, will remain undisclosed until moments before the event begins. Despite the DIY nature of the event, many people clamor to attend – in 2016, 30,000 people vied for one of 5,000 seats. This year, the dinner has expanded to include up to 5,500 guests. This number would make Philadelphia's dinner the largest Dîner en Blanc in the country for the second year in a row. Though Dîner en Blanc has only been a fixture in Philadelphia since 2011, Paris celebrated 30 years of the dinner on June 3. Since its launch in 1988, Dîner en Blanc events have spread to more than 80 cities around the world. If you make it off the waitlist, expect to pay at least $40 a person, plus tax, to participate, as well as a small membership fee, if the rates are the same as last year's. Those who have attended the event in the past will get a notification around late June about when they can purchase tickets for the August event. For first-timers, the waitlist is not a guarantee for entry; those who sign up will find out on July 13 if they were selected in the third phase of the lottery. In the meantime, check out some highlights from last year's dinner in Franklin Square.